I was looking at the icy black on the Lakeview roads in front of Theater Wit and thinking about those too-hard-to-pronounce words from UChicago’s motto, Crescat scientia. After spending three cold Novembers in the College, I had been well-taught about how to seek experiences that could bring valuable knowledge to my life, no matter how challenging circumstances were. 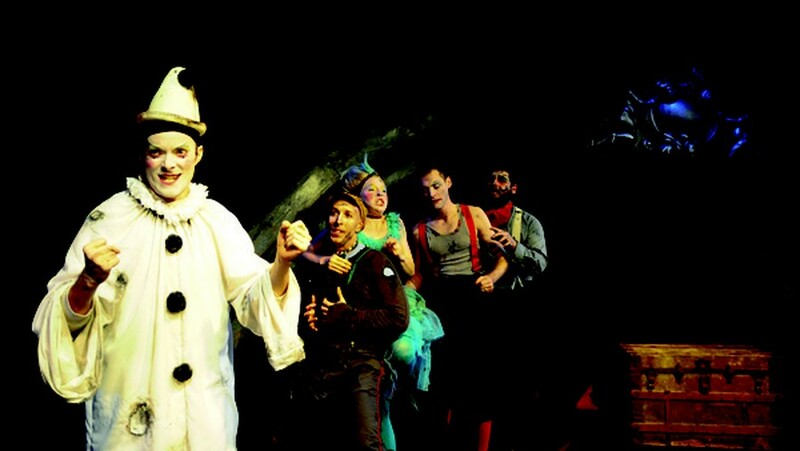 I was excited to see Burning Bluebeard, written by Jay Torrence and directed by Halena Kays, who teaches at UChicago. The play tells the true story of Chicago’s Iroquois Theater fire of 1903 from the perspectives of six clowns who died during the tragic event. This dual structure of the plotline provides a unique theater experience for audiences. Before the play got started, I noticed that there were large black bags on the stage floor. There was also a smell of something burning in the air. I said hello to Ms. Kays and took a seat. I could feel the chills all over my body. Lights off. Silence. Clowns emerged from the bags, and for the next 90 minutes my life became an emotional rollercoaster. The production was energetic, avant-garde, tragicomic, melodic, and strangely satisfying. The neo-futuristic evolution of the fairy tale was well-supported by the acting. Molly Plunk gave a memorable performance. The tall actress was in costume as a peculiar fairy queen who eats potato chips. The juxtaposition of folkloric and realistic elements created artistic moments that fueled the comedic undertone of the play. With Plunk’s acting, a fairy-tale fantasy became something more realistic and tangible. The director’s genius created a magical yet realistic world. The performers directly addressed the audience, and there were silent scenes consisting of wild gesticulating and dancing. Kays also integrated popular songs into the play. It was really entertaining to hear Amy Winehouse’s “Rehab” and a choir version of Nirvana’s “Smells Like Teen Spirit.” The end was also really powerful and melodic. I would highly recommend that everyone see Burning Bluebeard. I remembered the second half of the motto, Vita excolatur, on my way back home.